Boyhood interests in trains and electronics fostered my career as an electrical engineer, designing and commissioning signal and communications systems for railroads and rail transit agencies across the United States. Authoring articles for rail industry trade magazines inspired me to write novel-length fiction for my beloved anime, manga and anthropomorphic fandoms. Growing up in Michigan never far from one or another of the Great Lakes, my wife and I today make our home in Wisconsin with our son and a dog who naps beside me as I write. I belong to Allied Authors of Wisconsin, one of the state's oldest writing collectives, and the Furry Writer’s Guild, dedicated to supporting, informing, elevating, and promoting quality anthropomorphic fiction and its creators. Tell us about your writing - What genre do you prefer to write? What books, stories, other publications that you've written are your personal favorites? Anything new coming up? 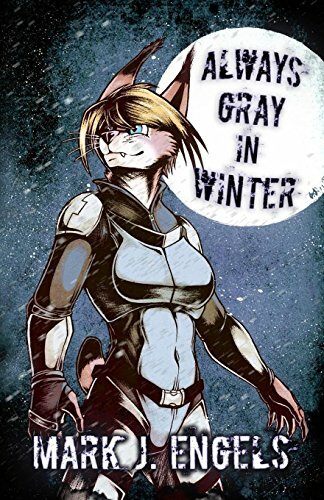 In my paranormal sci-fi thriller ALWAYS GRAY IN WINTER, first in a family saga series, the modern day remnant of an ancient clan of werecats is torn apart as militaries on three continents vie to exploit their deadly talents. This was the story I had in my heart to write, the kind of story I wanted to read and couldn't find. I've recently finished the draft for the next book in the series called FOR WHILE THE TREE BE GREEN. Editing it now before sending out to my critique partners. What about you as a person? What do you do to relax? Favorite movies or tv shows? Hobbies? I've been an anime, manga and anthropomorphics fan for decades, though these days I only watch shows that my grade-school age son and I can enjoy together. We really dug Wakfu and I'm hoping to get him hooked on RWBY (loved the first season and eager to share it with him.) He and I go train watching near our home over the very territory I used to work on before I left the railroad to begin work as a consultant. We also volunteer on a track gang (a.k.a., "the section") at a 15"-gauge live steam train near our home, whose tracks and rolling stock are about one-quarter full scale. What gets your creative juices going? Do you write to a music, and do you want to share your playlist? A number of songs inspired me during the creation my books’ characters and their individual stories. As I page through a copy of ALWAYS GRAY, for example, I can tell you scene-by-scene which song on Def Leppard’s 1996 album Slang each correlates to. The album was, in fact, one of my primary inspirations for this book and the ones to follow. The fact that the band’s name is derived from the name of another big cat? Purely coincidental. Though strangely apropos as one of the werecat fight sequences will be forever choreographed in my own headcanon with Guns ‘N Roses’ 1987 hit “Welcome to the Jungle” from Appetite for Destruction. Other tracks which inspired portions of my book include da Lepp’s “White Lightning” from Adrenalize, “Miss You in a Heartbeat” from Retro Active and “Gods of War” from Hysteria. Dire Straits also fostered my creative processes with several tracks off their 1985 release Brothers in Arms, namely “Ride Across the River”, “So Far Away”, “Why Worry”, and the titular track. And when the final fight sequences between my werecats play out one Christmas Eve in a port town in Eastern Europe? Trans-Siberian Orchestra's "Christmas Eve/Sarajevo" plays in my head on a continuous loop, of course. All that said, when I'm actually writing I require complete silence. I have to hear my characters voices, have to be able to eavesdrop on their conversations. I can't do that if there is music playing! Sometimes I even start a fan going--the white noise helps me focus. "All writers must have cats, especially if they write fantasy or speculative fiction." Do you have a stand on this one? Any cute pictures of your kitty or other pet? Growing up my family had a cat and a dog, but my adult life my wife and I have only ever had dogs. We still have one now, in fact. 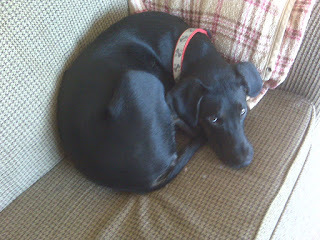 Picture attached of my writing buddy Toby. He keeps my spot on the sofa warm until I'm ready to sit down and write. What organizations do you recommend for those wanting to become writers? Any advice you'd like to share about writing? Adapt what is useful, reject what is useless, add what is specifically your own. Cast not thy pearls before swine. What writers inspired you to become an author? Gene DeWeese from his Adventures of a Two-Minute Werewolf. Robert C. O'Brien's Mrs. Frisby and the Rats of NIMH. Steve Gallacci's anthro comics Erma Felna, EDF and Birthright. Stan Sakai's long-eared ronin Usagi Yojimbo. I'd consumed content for so long and felt obligated to give something back in return. Any special appearances or events coming up that you want to mention? Hope to see several of you at Furry Weekend Atlanta 2018 April 5-8! Where I'll be reading from my book along with several other authors. If you could travel to any time in history, when would you visit? Post-WWII United States. The waning days of the steam locomotive's Gilded Age! If you could have dinner with any of your characters, which ones would you choose? What food would you serve? The combined Katczynski-Oporowo clan and I would sit down together one Christmas Eve for a traditional Wigilia feast. With one empty chair at our table for yon wayward traveler, of course. If you could travel anywhere, on earth or off, where would you go? Białowieża Forest and Belovezhskaya Pushcha, straddling the border between Poland and Belarus. Because that's where werecats come from! What color would you wear if you had only one choice? Navy blue. Just like the US Coast Guard's Operational Dress Uniform. Describe your dream writing spot. The shore of Bois Blanc Island's "West End", gazing out over the Straits of Mackinac and the Mackinac Bridge. While seagulls cry, the lake breeze blows, and lake boats pass by close enough to skip a rock off their hulls.